Already 30,000 people have fled their homes in northwestern Syria in anticipation of battles that are seen as inevitable. These people—according to the United Nations—have moved across the province of Idlib, which borders Turkey, many entering camps set up by humanitarian organizations. The United Nation’s Office for the Coordination of Human Affairs says that as many as 800,000 people might be displaced as the fighting intensifies. Syria’s border with Turkey is largely sealed off, but if the flood of refugees begins, that border will be their first destination. Sounds and smells of battle foretell what is to come in this last redoubt of al-Qaeda and other militants of the Syrian rebellion. All parties agree that the current situation cannot be allowed to fester. No one wants to see an al-Qaeda–inspired group take permanent hold of Idlib. There are well over 10,000 hardened fighters—many of them from as far off as Central Asia and southwestern Russia. The real debate here is how to remove these groups from the province. Discussion over the way forward began in May of 2017 in a process known as the Astana talks—which included Syria, Iran, Russia and Turkey. No real progress has been possible in these talks, largely because Turkey has not succeeded in breaking off the more moderate rebels from the al-Qaeda groups. No easy solution has presented itself. Syria does not want to have a permanent al-Qaeda presence on its territory. Iran and Russia disagree about the pace of the inevitable military conflict. Russia does not want to risk its fragile relations with Turkey. No one wants to see a humanitarian catastrophe in Idlib define the end of this already terrible war. The United States has said it would not tolerate what is to come in Idlib. It is worthwhile pointing out that the United States has been at war in Afghanistan for the past 17 years, during which it has intensified a major humanitarian disaster. One estimate suggests that in 2018 alone the United States-led war will result in 20,000 deaths. The United States has just made it clear that it would refuse to cooperate with the International Criminal Court over investigations of U.S. war crimes in Afghanistan. It is hard to take the United States government seriously when it speaks in the language of humanitarianism. The war on Syria is now seven years old, a period that has seen the devastation of this beautiful country. It is impossible to recall the early days of the protests in Daraa and then later in Damascus—Syria’s capital—and Aleppo—the country’s largest city. What followed was harsh bloodletting, over half a million dead and half of Syria’s population displaced from its homes. Blame for this war rests on many shoulders: on those of the Syrian government, surely, but equally and perhaps more viscerally on the Gulf Arab monarchies, Turkey and the West—which funded and cultivated the armed opposition to conduct a regime change operation in Syria. It was this funding and cultivation that enabled al-Qaeda to take the upper hand in the fighting and eclipse all the other armed sections of the opposition. If not for Iranian support and the support of the Lebanese and Iraqi militias as well as the Russian intervention in 2015, the government of Bashar al-Assad would likely have been overthrown (I tell this story in Death of the Nation and the Future of the Arab Revolution). After 2015, Assad’s government, with its allies, moved methodically from one town to another, defeating the al-Qaeda–led brigands. Those who surrendered were sent by bus to Idlib, near the Turkish border, and those who did not died fighting. The Syrian army took heavy casualties, but its morale—strikingly—did not deteriorate. By the end of 2017, six years into this war, Syria’s government re-established its authority along the western perimeter of Syria, where the bulk of the country’s remaining population lives and where those who fled the country to become refugees in Lebanon and Jordan have now begun to cautiously return. Three areas remained substantially occupied by other forces—a U.S.-backed enclave in the northeast, an Israeli-backed enclave in the southwest and the al-Qaeda–led enclave in the northwest. U.S. President Donald Trump has said that he would like to retain a force of about two to three thousand U.S. troops inside Syria’s northeast. It is unlikely that the Assad government would like to try and displace them. To come to blows with the United States is not on the Assad government’s agenda. The Israeli occupation of the Golan Heights is decades old and is now expanded down through Syrian proxies into the plains near Daraa. Syria’s army has already begun operations there. The U.S. has said it would not come to the aid of the rebel groups there, although it is unclear how the Israelis will eventually respond. Turkey, which borders Idlib, had wanted a negotiated settlement with the al-Qaeda rebels in the northwest. It did not want a full-scale assault there, largely because it is not prepared to take in close to a million refugees. It was nonetheless always going to be intolerable to the government in Damascus to allow an enclave of al-Qaeda rebels inside the country—which is why the main battle is to be there, in Idlib. No one denies that the most powerful fighting force inside the rebel enclave of Idlib is the al-Qaeda–inspired group Hayat Tahrir al-Sham (HTS). HTS emerged out of an alphabet soup of jihadi groups that had either affiliated themselves directly with al-Qaeda or who shared some form of ideological connection with it. Alongside HTS is Tanzim Hurras al-Din, a fiercer organization with little appetite for a negotiated settlement. They are bolstered by hardened jihadi groups that came from Central Asia (Turkistan Islamic Party, Katiba al-Tawhid wal-Jihad and Imam al-Bukhari Brigade) as well as from Chechnya (Junud al-Sham and Ajnad al-Kavkaz). Negotiation with the Assad government is off the table for these groups. They either want to be left alone in this enclave—a 6,000 square kilometer zone—or they will fight to the end. Safe passage to another part of Syria is impossible. The Syrian government brought these fighters here from other negotiated settlements. They will not move them elsewhere. Turkey will not permit them to go to a third country. In fact, third countries are increasingly impossible to find. No one will allow them to go to Afghanistan or Libya, to provide reinforcements for wars that are ongoing. Flight is impossible. It is equally impossible for the Syrian government to allow these fighters to remain in control of the Idlib governorate indefinitely. In May 2017, as part of the Astana negotiations, the Syrian government and the Russians allowed the Turkish government time to find an alternate solution. Turkey established observation posts on the outskirts of the enclave. The Turkish government had attempted to peel off the less hard-core insurgents from the al-Qaeda core. But this was an impossible mission. The less ideological groups recognize that HTS is the most effective fighting force, and they did not want to turn against them. Besides, HTS has made it a practice to imprison and kill anyone who gestures toward moderation. HTS and the other groups have established a joint operations room to coordinate their battle against the Syrian army. That has been their answer to the Turkish entreaties. Officials of the Turkish intelligence services say that even with time it is unlikely that they would be able to come up with the perfect solution. Space for negotiation is limited. Would it be enough for the Russians if the rebel groups agree to end shelling the Russian airbase in Hmeimim (Latakia province, Syria)? Would it be enough if the rebel groups agree to free transport along the Aleppo-Damascus and Aleppo-Latakia highways? None of these issues could be sorted out over the course of this past year. Turkey has had a hard time getting the rebel groups to offer any concessions. Turkish officials say instead that they have been threatened by these groups, who say that if Turkey betrays them to the Syrian army, then they will cross the border and wreak havoc inside Turkey. The al-Qaeda groups could get to Reyhanli in under an hour. In two hours or so they could get to Antakya. Turkey has taken these threats seriously. 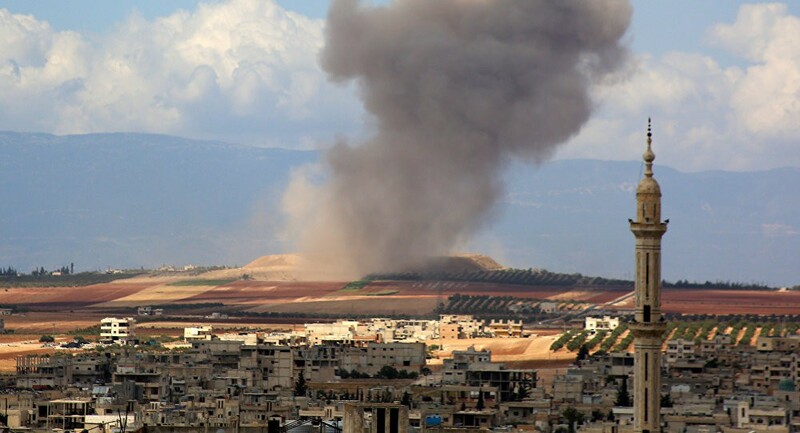 An informed source says that the initial bombing by the Syrian army and the silence from Turkey is intended to send a message to the outer rim of the rebels, those with no firm al-Qaeda commitment. What that message says is that the rebels are being left alone to fend for themselves and that it would be better to cut a deal now before the terrible slaughter starts. This bombing is not the first salvo in the final battle but the last attempt at a negotiation. Those who listen to the sound of the bombs fall are stuck in a circular debate: all acceptable solutions for the end of this war are unrealistic and all realistic solutions are totally unacceptable. Vijay Prashad is the Director of Tricontinental: Institute for Social Research (thetricontinental.org) and Chief Editor of LeftWord Books (leftword.com). He writes regularly for The Hindu, Frontline, Newsclick, Alternet and BirGün.